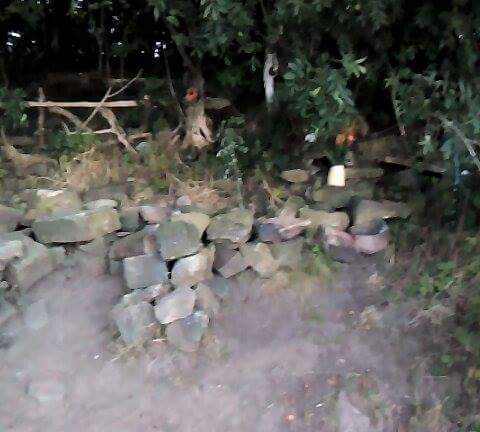 Home / Uncategorized / Hoober stand, Rotherham, A second Alter Found? Possible Evidence of WitchCraft? Hoober stand, Rotherham, A second Alter Found? Possible Evidence of WitchCraft? 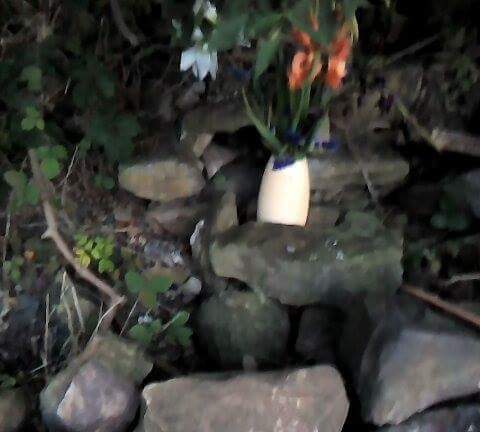 So after investigating the area hoober stand, Rotherham, some more we can say we have came across what appears to be some kind of other alter. 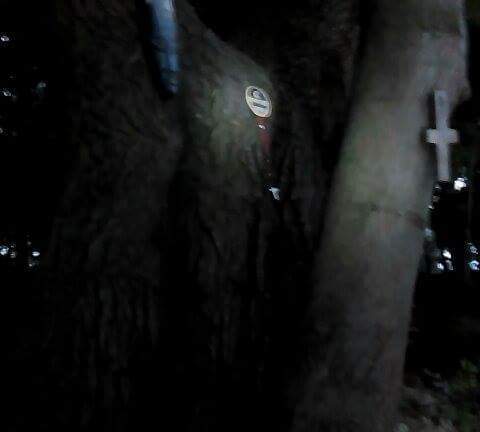 We found items around this area which indicated that this area may be of good energy, love hearts with quotes on ‘have a nice day’, flowers and dream catchers and such things….But set behind this is a blue mask pinned to a tree, I am unsure of the significance to this, seance sticks and crosses which appear up side down. The information regarding masks like this all indicates witchcraft, but to what kind of witchcraft is the question. 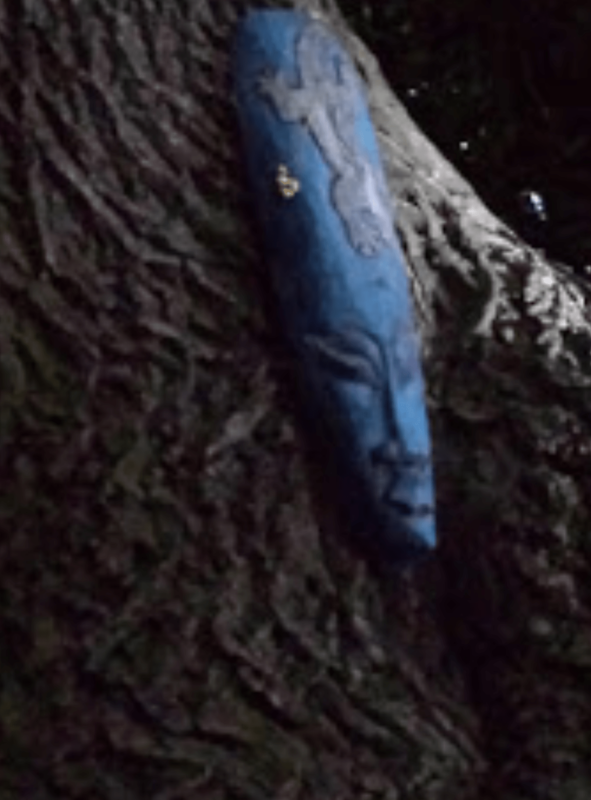 A fang mask is often worn by spiritual leaders during rituals, to drive away evil spirits, or are shown as symbols depicting wealth and prosperity. 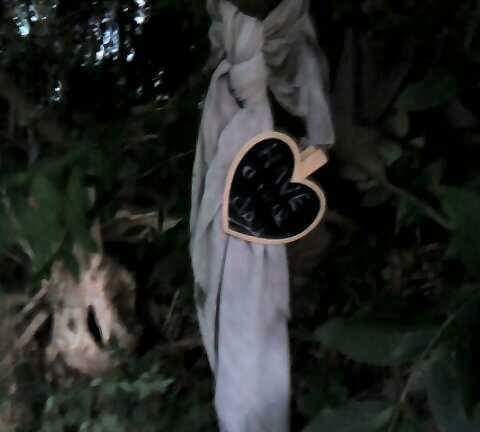 Pictured above is another some kind of sign and a cross which is upside down, on the sign it reads ‘Enamour’ which in latin means be filled with love for. Now after researching into the up side down crosses I came to realise that normally these are pinned up this way as a marking of mocking christ. Here is some research I have found surrounding the history of the upside down cross, and what it symbolises in recent times. ‘The upside-down cross, or the inverted cross, is a symbol with a long history and, in modern times, divergent meanings. As its name implies, an upside-down cross is simply a Latin cross turned so that the crosspiece is closer to the bottom than the top. A person hanging on such a cross would be positioned head-downwards. For centuries, the inverted cross was considered a Christian symbol, based on an ancient tradition that the apostle Peter was crucified upside down. One version of the story says that Peter, facing martyrdom by crucifixion, requested that his cross be inverted because he felt unworthy to die in the same manner as Christ. The upside-down cross, sometimes called the Cross of St. Peter or the Petrine cross, thus became a symbol of humility. The inverted cross is sometimes associated with the pope, who Catholics believe can trace his authority back to Peter. Artwork featuring the Petrine cross may contain an overlay of the “keys of heaven,” based on Matthew 16:19. Recently, however, it is common for the upside-down cross to be used as a symbol of atheism, humanism, and the occult. Several black metal bands use an inverted cross to call attention to their supposed devotion to Satan. Upside-down crosses appear in horror movies such as The Omen and The Conjuring as a signal of demonic activity. The symbol crops up in tattoos, on pendants, and as a logo on t-shirts. Sometimes, it is accompanied by statements such as “Believe in Yourself,” “There Is No God,” “Black Mass,” or “Not Transformed.” In these contexts, the obvious intent of the inverted cross is to declare an opposition to Christianity. Turning the cross upside down becomes a means of denying the truth of Christ and mocking His sacrifice. This specific arrangement feels somewhat like the jackle and hyde effect, with the flowers the dreams catchers then behind indicates a much more darker area to the location. Attached is the Facebook lives I did when we had found this, signal was poor in this location at the time so please forgive me for the sound freezing and it cutting off but it does show the location and the find. Again set back, so set back that you wouldn’t perhaps notice it if you wasn’t looking for it, these are quite cleverly hidden away, and what spiritual practices actually do take place at these arrangements who knows but one thing we feel for sure is that witchcraft does exist within this location we just are not sure on which scale it is, as we investigate this location further we may hopefully be able to shed some light or darkness on the matter 😉 in the near future. Also attached is a echovox session which was taken place in this area Hoober Stand on the 30/7/16 by Knight Templar Paranormal. 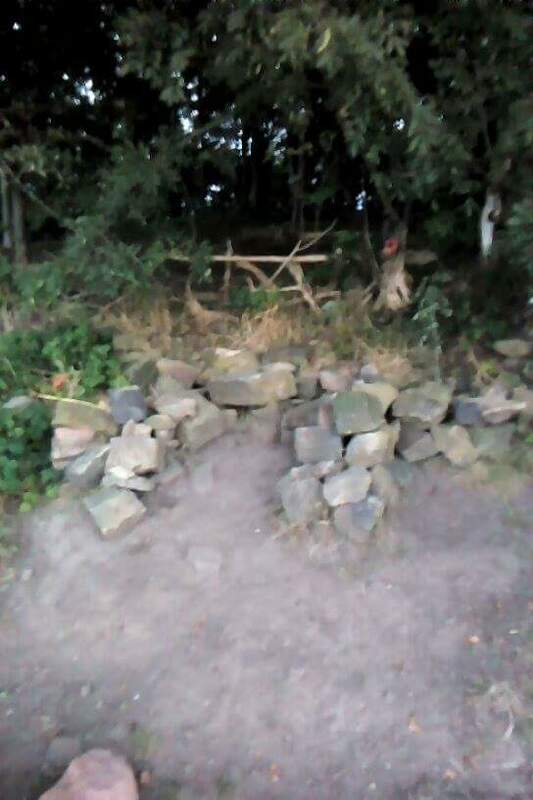 Previous post: SACRIFICE ALTER FOUND AT HOOBER STAND, ROTHERHAM?